Jeffrey Becker is a Mediterranean archaeologist. Becker has held teaching positions at the University of North Carolina at Chapel Hill, The College of William & Mary, Boston University, McMaster University, the University of Mississippi, and the Joukowsky Institute for Archaeology and the Ancient World at Brown University. Additionally, Becker served as Acting Director of the Ancient World Mapping Center at the University of North Carolina at Chapel Hill. He is an Associate Editor of the Pleiades Project and contributing editor for Etruscan and Roman art at Smarthistory.org. Becker is a veteran of archaeological fieldwork in Italy, notably on the Palatine Hill in Rome with Clementina Panella and the University of Michigan’s project at Gabii in Central Italy. 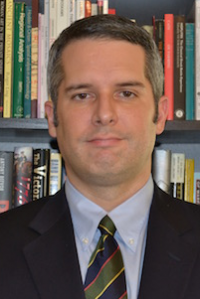 He is currently a visiting assistant professor in the Department of Classical and Near Eastern Studies at Binghamton University – SUNY. His research interests encompass the whole of ancient Italy and the Roman Empire, but relate, in particular, to issues of regionalism and regional interaction and the role played by these phenomena in the fashioning of Italy during the time of the Roman Republic.